Average Height	: 11" - 13"
Average Weight	: 5 - 12 lbs. Photo Courtesy of : Crest-Care Breed Rescue, Inc. The Chinese Crested originated in Africa where they were called "African Hairless Terriers." Chinese trading ships stopped along the shores of Africa on their routes and brought the dogs onboard their ships to hunt vermin. They renamed the dogs "Chinese Crested" and the name stuck. Ancient wandering Native American tribes (Aztecs) kept them as bed warmers and also ate them. Two Chinese Cresteds were first exhibited in 1885 at the Westminster Kennel Club Show in New York. When the breed was brought back to China they were bred smaller and with a greater emphasis on temperament, then redistributed in trading ventures as the "Chinese Hairless" or "Chinese Crested". Patellar Luxation-dislocation of the kneecaps, common in all small breeds and some of the larger breeds. Dental problems-often this breed is born with incomplete teeth both as puppies and adults. Teeth tend to fall out at an early age and also have extreme tartar build up. Grooming the Chinese Crested Dog depends largely on the variety of Chinese Crested Dog. The Hairless variety requires more overall attention although less actual grooming. A grooming comb can be used to keep the hair on the tail, head and feet free from mats and tangles on a daily or every other day basis. The skin of the Hairless Chinese Crested Dog does require care. They require regular bathing to prevent acne from forming on the skin. Always use non-allergenic and scent free dog products, never use human products or perfumed products on these dogs as they are prone to allergies. Talk to the breeder about a brand or type of skin care products they recommend for the dog. The hairless Chinese Crested Dog will need moisturizer applied to the skin to prevent drying and flaking. In the summer months a good quality sunscreen should be applied to the skin before the dog is taken outside. In the winter some type of coat or sweater should also be used, even if the dog is simply going outside to toilet as they are very susceptible to chills and colds. The Powder Puff Chinese Crested Dog will need regular daily or every other day grooming to keep the long, silky hair looking in the best possible condition. The outer coat can be groomed using a wide toothed comb and the heavier, thicker undercoat will need special attention to ensure that mats and tangles are not forming. The Chinese Crested Dog doesn't shed like other dogs but the dead hear that is dropped from the skin will become trapped in the existing live hairs, resulting in mats that become progressively worse. Regular grooming on a daily or alternative day basis will prevent this problem from occurring. The teeth of the Chinese Crested Dog are very poor, with the hairless variety having the lightest coating of enamel, resulting in tooth decay and early loss. Start regularly brushing the Chinese Crested Dog's teeth as soon as possible, ideally from their puppy stage. The Chinese Crested Dog is prone to weight gain if inactive, so finding a way to keep your Chinese Crested Dog active is important. They do enjoy outdoor walks and are good on the leash once properly socialized and acclimatized to being in new environments and places. Since the Hairless has no protection for its skin it is not recommended for walks that involve going through brushes or even heavy grasses as the skin can easily be cut or injured. 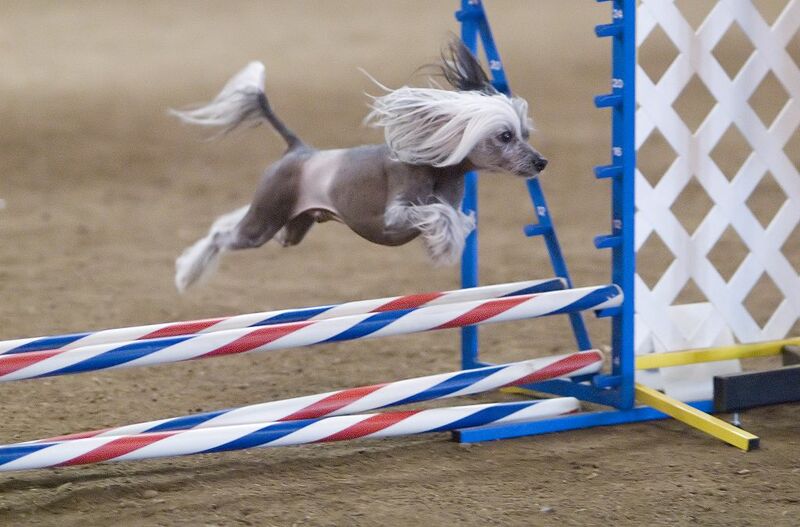 The Chinese Crested Dog does enjoy playing, but care must be taken to avoid accidentally injuring these small dogs. They love to spend time with kids and do best with children that understand the unique needs of this small dog. The Chinese Crested Dog can be taught to fetch and retrieve and loves to play games like hide and seek either with favorite toys or with the family. They do get along well with other dogs and will play and interact with dogs, cats and other pets. Again it is more important to monitor any injuries that may occur on the hairless variety as they don't have the natural protection of a protective coat. The Chinese Crested Dog will quickly learn to play and run in the house, often to the delight of the family. They are very agile and can climb similar to a cat often surprising owners with the strange places they manage to climb into. Try to avoid having the Chinese Crested Dog jump either up or down as this can lead to joint problems as the dog matures. The Chinese Crested Dog is considered a breed that is very easy to train. They are naturally very clean dogs and even as puppies will do their best to avoid messing in the house or in areas where they are kept. Since in very cold or very hot climates going outside to toilet can be a problem, many owners of Chinese Crested Dogs teach these dogs to use litter boxes or even puppy pads. The Chinese Crested Dog, without socialization and exposure to new places, animals and people, will have a tendency to become frightened and timid. While not a problem barker they can become problems if they are very nervous or bored, so provide lots of socialization as well as things to play with and chew on. They can become destructive with chewing if left alone for too long but exercise, chew toys and lots of human attention can prevent this issue from becoming a problem. The Chinese Crested Dog is an ideal dog for those that want a pet that can do unique and interesting tricks. The Chinese Crested Dog is known to commonly sit up, walk on his or her hind legs, jump through and over objects and climb ladders and other objects with just a bit of coaxing. Since they are very "in tune" with their owners they will do whatever it takes to make the owner happy. One tendency with these dogs is to really baby them because of their small size and waif like expressions. Too much carrying and coddling can actually cause these dogs distress and increase the likelihood they will have separation anxiety and problem behavior when left alone. They are dogs and need to be given time to just be dogs. Socialization with other small dogs, interactions with cats and other pets and playing with kids and family members is an important part of both training and socialization. The Chinese Crested Dog loves to dig when outside so you may wish to train the dog to use a particular digging area, rather than the landscaped areas. Consider hiding a few treats of favorite toys in the area then praising the dog for digging them up. They will quickly learn where is a good place to dig and where they should not.